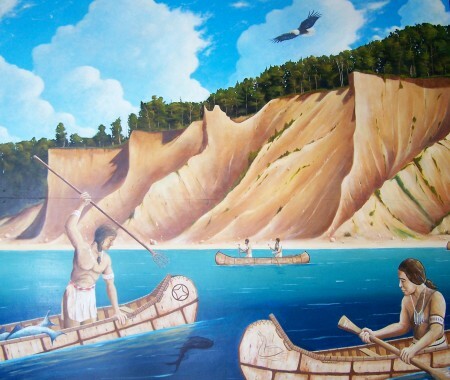 The above scene is taken from our first outdoor mural depicting Native Americans spear fishing off of Chimney Bluffs in the 1450s. But how much do we really know about the Native Americans on Sodus Bay? The short answer is not very much. From the oral traditions of Native Americans, we know that Sodus Bay was shared by the Seneca and Cayuga tribes approximately down the center of the Bay. Both tribes used the Bay as their summer homes because of the fishing, abundant game, berries and chestnut trees. Both tribes left our area in the second half of the 1700s because they knew Europeans would be soon arriving. By that time, they knew disease and death would follow as a result. When discussing Native Americans and their influence on our area’s history, it is important to have a proper perspective. Archeologist estimate that humans inhabited our Bay for approximately the last 10,000 years. A full 95% of that time was by the Native Americans and only 5% by Europeans and subsequent Americans. Because there are no written records among the Native Americans about Sodus Bay much of there history on the Bay has been lost. We do have some tantalizing clues from amateur archeology done by Bill Huff, Jr. These clues involve where did the summer camp exist? There are strong indications that the main summer camp for the Native Americans was located in the Sodus Bay Heights area. In the field around where the water tower now stands, hundreds of Indian arrow heads were excavated by Bill Huff, Jr. in the 1950s. Other folks (such as Bud and Jean Seymour as well as Henry Zerbe) have also found them on their property. It makes a lot of sense to locate your summer camp in such a strategic area. You have easy access to the bay, a great view of much of the Bay so you can see any threats coming at you from that direction and occupying the high ground makes for a more defendable location. When Bill Huff, Jr. was young, he found what appeared to be the stone remnants of 2 weir in Maxwell Creek south of where Maxwell Creek B&B now exists and before the waterfalls. The two weirs were about 15 feet a part. A fish weir is an obstruction placed in tidal waters, or wholly or partially across a river, to direct the passage of fish. A weir may be used to trap fish such as salmon as they attempt to swim upstream, or eels as they migrate downstream. 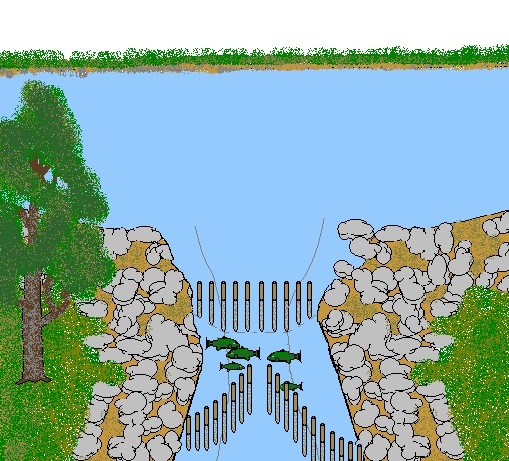 Alternatively, fish weirs can be used to channel fish to a particular location, such as to a fish ladder. Weirs were traditionally built from wood or stones. The use of fishing weirs as fish traps dates back prior to the emergence of modern humans, and have since been used by many societies across the world including Native Americans. He also found another weir on 3rd creek. After being trapped in a weir, the fish could be speared or just hand thrown onto shore. Assuming the Viking Spearhead found at Charles Point was brought here by the Native Americans, it would indicates that the Native Americans were spear fishing at that location as well. It is a pity that we know so little about these people who constitute so much of our past!